There is a great project that is looking for backers on Kickstarter, and there are only 3 days to go if you want to back the Cypress Umbrella. Yes, it is an umbrella, but it might be the last one you will ever need to buy. We can say this because this umbrella was designed in such a way that it won’t turn inside out and it will surely not break. So those days when your umbrella broke because of the wind and left you without protection in the rain are gone. This project was developed by Hedgehog Products Inc, a company that is made up of two people: Cahay Ho and Kevin Truong, both of them being mechanical engineers. Who else could have come up with a structure for an umbrella which just won’t break, even in windy conditions? The two men started thinking about a way to make umbrellas more resistant without needing to add any weight to them. And they managed to accomplish this. They created the toughest umbrella, which is based on a fully telescopic structure which can resist to high winds without bending or breaking. Because you could get bored with the same umbrella your entire life, they even thought of a way to create an umbrella which has an interchangeable canvas. The fully telescopic frame architecture of the Cypress combines the collapsible stem of traditional umbrellas with a telescopic rib design that is quite innovative. What really differentiates the Cypress from other umbrellas out there is the fact that each rib is made of tubular sections that are coupled with precision machined joints and stainless steel pins. These allow the ribs to work like the automotive suspensions in order to reduce the shock caused by high winds. This way the umbrella won’t break and won’t disappoint you when you need it the most. The interchangeable canvases are easy to use due to the quick snap connections along the ribs. You need only one structure and a set of canvases in order to actually have a whole fleet of umbrellas, to match your clothes, the event or simply your state of mind at the time. 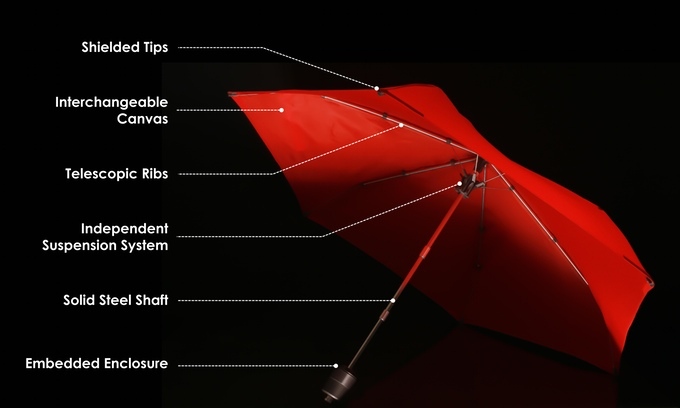 Changing the canvas of your Cypress Umbrella will only take you 3 minutes to complete. Thet is less than actually buying a new one. The developers even thought of integrating an enclosure for the umbrella so you won’t get the things already in your bag wet. It comes out of the handle, so you will definitely not lose it. For those who like the bigger umbrellas, that don’t fit in a bag, Hedgehog Inc. created the Cypress Umbrella Classic, which is a full- length umbrella with wider coverage, but the same resistant Independent Suspension System, and interchangeable canvases. If you are one of those light- headed persons that frequently lose their belongings and you wouldn’t like to lose your umbrella, Hedgehog Inc. promised to offer a Bluetooth tracker add- on for $25/ set if they hit $80.000. If you decide to back the project, you can do it in the next three days. $5 will get you special thanks and a virtual high five, for $10 or more you will receive a custom Hedgehog figurine, and a $59 or more pledge will ensure you an Early Bird Classic package, containing one Classic frame and two Classic canvases. If you choose to spend $64 or more you will get the Kickstarter Exclusive Classic package that will bring you the same umbrella theEarly Bird Classic package would. Other offers include couple’s packages or family packages, and even party packages that contain 10 umbrellas and 20 canvases. If you pledge $5000 or more for the project, you will receive a family package, 3 hedgehog figurines, and a full day- tour of Vancouver with the co- founders and you will also get to take a look behind the scenes at the development of the Cypress Umbrella.